Nowadays most places will have the legendary MAD device that allows delivery of atomised solutions. However if you find yourself in a tight spot where no clever gadgets are available you may find this simple device useful. If you need to deliver medication as a spray, say for topical anaesthesia in a space with limited access (e.g. quinsy). You can fashion a simple device that will enable you to do that. The assembly is quite simple as shown in the picture. You can use either oxygen or air – it does not matter. Once the gas is on, gently push the plunger in the syringe with medication and enjoy watching misty flow being delivered to the target. 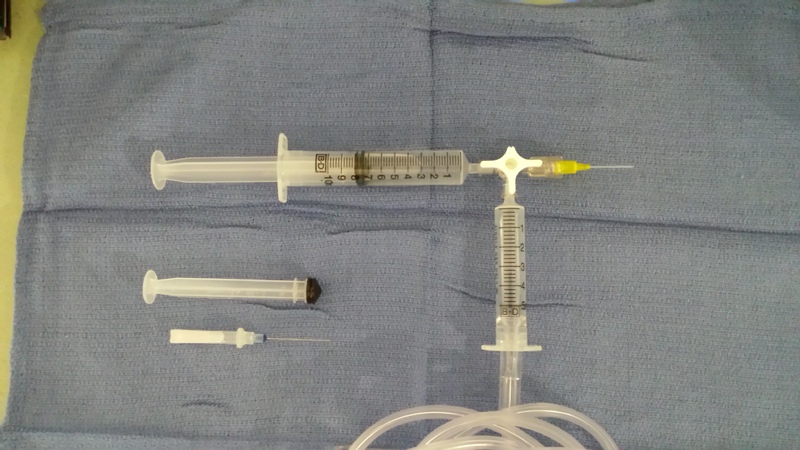 Having the oxygen tubing inserted into the chamber of the 5mL syringe provides some safety, that is the tube will pop-out of the syringe when the pressure raises to ~40cmH2O. Once you’re ready to use the device and it is connected to the gas supply – leave the gas off until you are ready to fire the juice – slowly turn the gas on. Make sure that the stopcock is in the correct position. 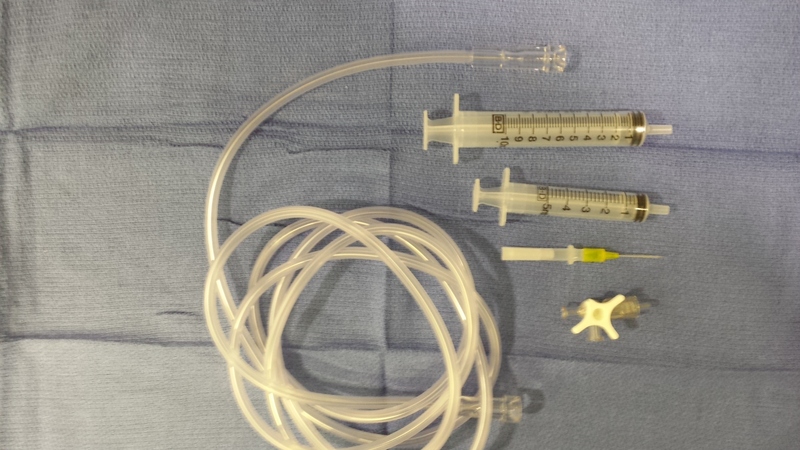 If the flow is too high the oxygen tubing will pop out of the syringe, so start low. The optimal flow is 2-3L/min. Make sure that you apply gentle counter pressure on the plunger of the syringe with medication, otherwise the gas will push it back and if the flow is too high – it will pop it out of the syringe and hit you in the eye. Of course, you can always have the medication delivered through nebuliser if the area is in the oropharynx or mouth if your patient is compliant and spontaneously breathing. Editor’s noteBig thanks to Dr Lev Veniaminov, EM Registrar, aka Greedylobster for his first contribution to the blog. Writing about one’s Magivered-up equipment adaptations is always a fraught matter. It should be noted that there is no TGA or FDA License for this application of an IV cannula, syringe and oxygen tubing. We can’t strictly recommend it and anyone using it takes the risk that it could all go pear shaped and they’d be on their own. That said, doctors have been coming up with their own adaptations to suit tricky situations for ever and Lev has described something he has had success with here. What you do with the information is up to you.